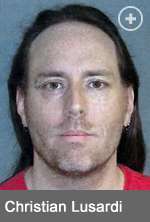 North Carolina native Christian Lusardi was sentenced this morning to five years in a New Jersey state prison for his scheme to defraud participants in a large preliminary event at the 2014 Borgata Winter Poker Open. Christian Lusardi’s New Jersey mug shot. Lusardi, now 43, reached a generalized plea deal with authorities in late March, though he officially pled guilty on August 13 to charges of second-degree trademark counterfeiting and third-degree criminal mischief. Lusardi was sentenced this morning by Judge Bernard E. DeLury Jr. in Atlantic County Superior Court. a press release issued today by New Jersey’s Office of the Attorney General does not specify whether Lusardi’s five-year term will run concurrently or consecutively to a separate five-year term which Lusardi is presently serving after pleading guilty in a separate counterfeit-DVD case. As previously reported here at FlushDraw, the third-degree criminal mischief charge is connected to two episodes of damage caused by Lusardi’s panicked exit from the scene of his January 2014 escapade. After obtaining bogus chips and stickers bearing the “Borgata” tourney design from an underground Chinese manufacturer, Lusardi then introduced several hundred of them into a major re-buy event at the Borgata. Once the scheme had been discovered, but before Lusardi himself was identified as the culprit, he attempted to dispose of large quantities of the fake chips at another Atlantic City casino, Harrah’s. Harrah’s was previously granted $9,455 in restitution back in March, for the plumbing damage that Lusardi caused. However, that paled in comparison to the $463,540 in restitution that Judge DeLury ordered Lusardi to pay to the Borgata for lost Winter Poker Open revenues, following the cancellation of the re-buy event. It’s not likely that the Borgata or Harrah’s will ever see any of that court-ordered restitution, which ultimately puts them on a par with the 27 finalists in the re-buy tourney that Lusardi fouled with his phony-chip scheme. Those players collectively suffered hundreds of thousand of dollars in losses when New Jersey gaming officials ordered the prelim event cancelled, while hundreds of other event entrants received buy-in refunds despite provably having never been exposed to Lusardi or his phony chips. The pathetic but lengthy Lusardi counterfeit-chip tale likely ends with today’s sentencing, though it goes out with its own cheesy summation, courtesy of the New Jersey AG’s office. Today’s presser on the sentencing from that office provided a fitting and final low point, offering plenty of self-aggrandizing and cheesy poker-themed quotes while failing to even get the basic facts of the case straight. For instance, the NJ statement claims that the entire three-week 2014 Borgata Winter Poker Open was cancelled, when in fact only the preliminary event was affected. The rest of the series continued on with little interruption, though under a cloud of controversy regarding alleged lax video security in the venue which prevented Lusardi’s fake chips from being discovered earlier. 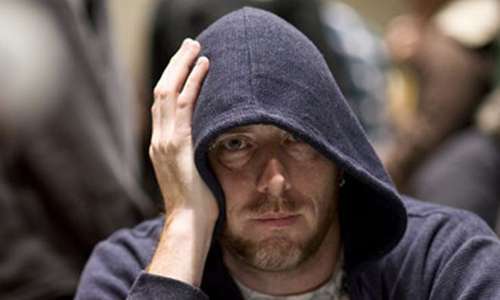 Lusardi busted completely from the re-buy event’s Day 1A flight, despite using some of the bogus chips, then rebought in the Day 1B flight and parlayed his phony clay into that session’s chip lead. Ecchh, good riddance, and “Bah humbug” to all of it. Lusardi gets to spend some more (and well-deserved) time in the can, though a lot of other poker players and poker itself suffered here as well, through no fault of their own.